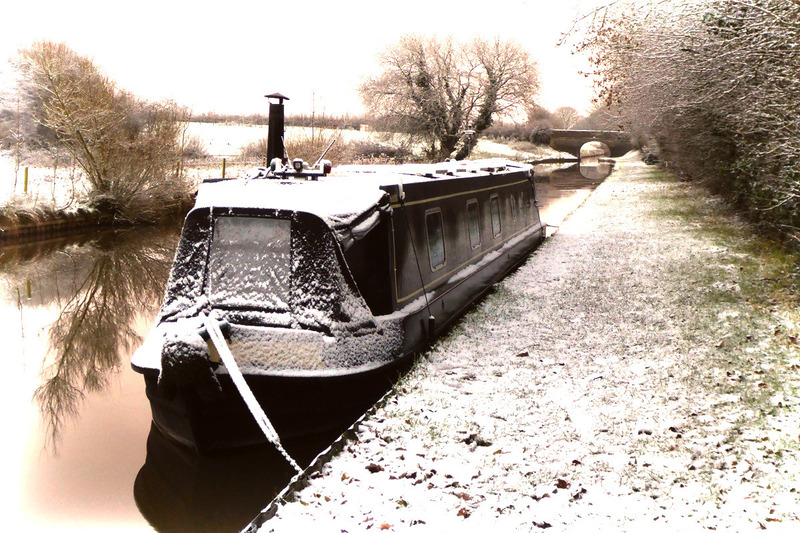 A spot of snow on England’s old canals #winter #england #offgrid – The Diesel-Electric Elephant Company. I had a real treat this morning. There I was, sitting at my desk snorting my first coffee of the day, when a spherical red robin landed in the snow-covered hedgerow right alongside my window. I think that perhaps, just perhaps, winter may have arrived in England. No photograph of course, I tried but it seems that robins, like herons – but not crows – have polarising vision that can see right through the Cardinal’s one-way glass. The weather forecasts of late have been chaotic. Storm Cedric or something, kicking up winds of ninety miles per hour and then dragging chilly air down from the arctic regions. It’s easy to tell when the Meteorological Office hasn’t really got a clue (they put out a weather forecast). No, but seriously, it’s changed from hour to hour. Other regions of the country, and indeed the British Isles, have seen eleventy-twelve miles of snow and wotnot, while here – so far – the response has been largely muted. It blew a thorough wobbly the other night and then calmed before morning. I may soon have to settle, as Mr Meat Loaf suggests, for two out of three and “ain’t bad”. Snow layer has been brushed from the solar panels, and it is good to see the snow on topsides – it indicates that our insulation is doing some good work. I did send one of the younger midshipmen out early this morning, to clear the inch or so of snow from our solar panels. It should be noted that aboard the Cardinal I am Captain, Cook, Chief Bottle-washer, Stoker and several Midshipmen. Needs must. The panels, even on a relatively dour and dismal December day such as today, are rewarding me with five or six of the electric amps in the brighter moments. To warm myself up after my endeavours aloft and barefoot in the rigging I have bread baking in the oven. Possibly the aroma is why Mr Spherical Robin keeps coming back to the hedge to peer in at me. I feel that toast and Marmite is essential on such a day. Lucky robin that I am of the vegetable aryan persuasion, and do not make robin-sandwiches. What do you do with the legs when you make robin sandwiches? Do you tuck them in or let them dangle? England is all looking very picturesque, but I don’t doubt that several race meetings have had to be cancelled due to inclemencies under equine foot (hoof), resulting in lots of disappointed horses kicking about in their stables. I took the electric cameras for a walk, and I shot a little bit of video too, although the interwebnets connection here is not quite up to the task of allowing Youbend.com to feast upon it. Later, when I have the signal. I have taken the usual liberties with the photographs, the better to cheer them up in a uniformly soggy and flat grey light. Eardswick Hall Bridge, “Bridge 13” of the Middlewich branch of the Shropshire Union canal, looking north. Eardswick Hall Bridge, “Bridge 13” of the Middlewich branch of the Shropshire Union canal, looking south. Whatever would we drearies photograph were it not for bridges, eh? I took a short stomp up the towpath while it was snowing properly earlier, just to see that everything was being done according to my orders. Looking slightly away from Church Minshull, as the more polite persons of society do. I set the camera flash on here, just to capture a few snowflakes. The Cardinal is closest to camera, the boat just along and the one barely visible farther on than that are a bit “M. Celeste esquires”. Weather or no, within reason, we must soon mooch on, but not, I think, today. I do hope that you’re all wrapped up well and warm and, if you have loved ones, please remember the advice of the R.S.P.C.A., and do let them in out of the cold. Accordinng to both the letter and the spirit of the law, a wife is for life, not just for Christmas. I’ve seen car bumper and window stickers to much the same effect. Which advice reminds me, I must slash open another sack of coal. Then I must plan to make certain that I meet that nice Mr Fuel Boat again when next he passes by. Chin-chin for the mo, &etc. Some of your pictures look like Van Gogh paintings, very pretty. You do make me smile, Ian, thank you. Wind registered 105 mph yesterday, lots of snow. Have to put our big coats on now and not wear shorts. Looks so lovely in the pictures, and although we had a heavy frost, so far it has been sunny. I am convinced I live in a kind of Bermuda triangle where the weather disappears into a black hole or else I live under a dome that you can’t see. Keep warm!